The chrome frame of this rectangle cafeteria table will complement your choice of laminate beautifully. These cafeteria tables are designed for safety and convenience. From setup to cleanup and everything in between, they will help keep things running smoothly in your lunchroom. 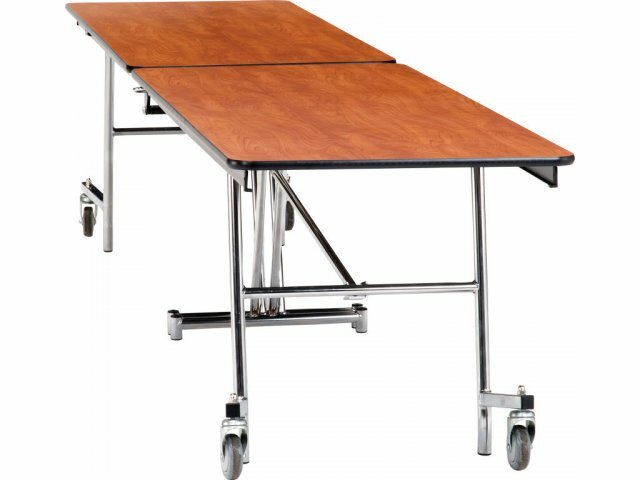 Heavy-duty casters lift off the floor when the table is in the open position and a torsion bar system allows one-person opening and folding. 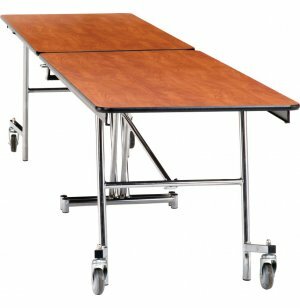 To prevent tripping, casters do not extend beyond the surface of the table. A low-maintenance laminate surface and phenolic backer make these cafeteria tables durable and easy to clean. When fully opened or closed, an automatic lock engages to ensure stable positioning and prevent accidents. Tamper-free hardware ensures that these lunchroom tables will stay in great shape for many years to come. Edge Protection: Surface edges are protected against scratches and dents by T-mold edge banding.